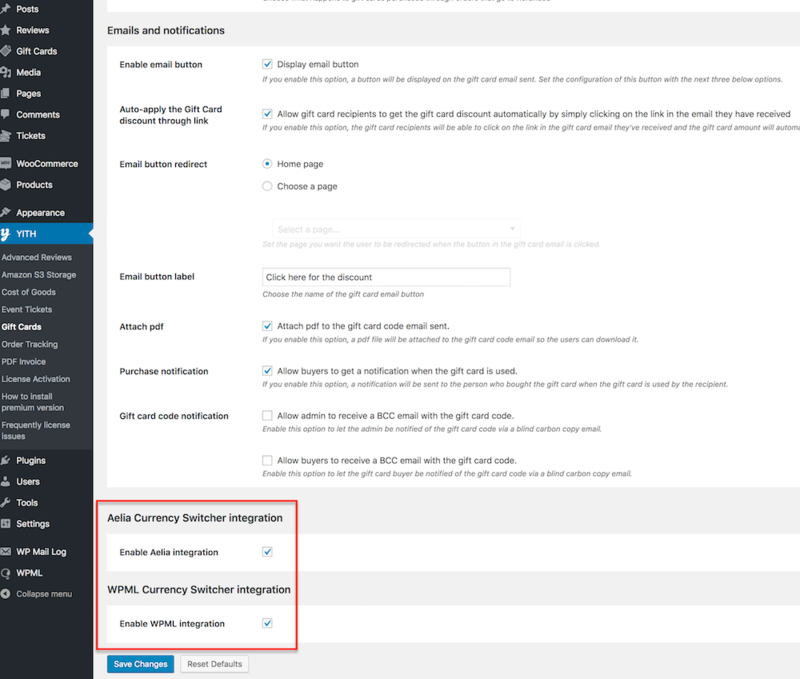 When activated you can use either the Aelia or WPML currencly switcher plugin in combination with the YITH WooCommerce Gift Card plugin. After activating the currency switcher plugin, a new option appears in the Gift Cards “General settings” page. Here you can check the Currency switcher to enable the option for your site. With the WPML integration enabled, it works as another product type. The gift card prices are defined in the default currency, so when the customer selects another currency, the gift card amounts are converted to this currency. With the WPML integration disabled, the price in the different currencies will be the same as the main product (they are not converted), for example, if you have a gift card of 25$, and the customer selects Euros, he will purchase a 25€ gift card. With the Aelia integration enabled, the gift card prices are defined in the default currency, so when the customer selects another currency, the gift card amounts are converted to this currency. (The plugins will not work together if the integration is disabled).